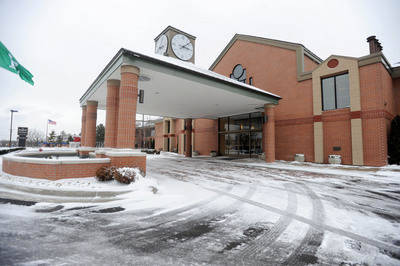 When Ann Arbor-based Dahlmann Properties purchased the former Comfort Inn on Carpenter Road in Pittsfield Township in 2006, it was outdated and struggled to get guests. But after completing an extensive, four-year renovation project in summer 2011, occupancy levels at the Pittsfield Township hotel are slowly but surely stabilizing, Dahlmann said. Formerly a Comfort Inn, then a Quality Inn, the hotel also has a new name now: the Ann Arbor Regent Hotel & Suites. In Washtenaw County’s hotel industry, the average occupancy rate was 64.5 percent in 2011, up from 58.5 percent in 2010, according to Chuck Skelton, president of Hospitality Advisors Group of Ann Arbor. Although that outpaces the Regent’s rate, the owners said they’re pleased with their property’s progress. From replacing all the furniture to adding a 24-hour fitness center, the 2-story, 125-room hotel received an extensive facelift, said Aaron Taylor, the hotel’s director of sales. There’s a new covered entranceway with brick pavement and a fountain, a repaved asphalt parking lot, and a new game room and fitness center. The 3,200-square-foot conference center and banquet hall, which is separated from the hotel, was redesigned for both social and business meetings. A large catering kitchen was also installed. The former drop ceiling panels in parts of the hotel were replaced with drywall to raise the ceiling height. The Ann Arbor Regent Hotel & Suites finished an extensive renovation project in an attempt to target new clients and increase occupancy. The old artwork was replaced with new pieces, many of which are from the Ann Arbor Art Fair. The indoor pool mechanics were moved into a guestroom to provide better views into the hotel’s new courtyard and outdoor seating area. Along with new layouts, the redesigned rooms have new furniture, carpeting, drapery and televisions. Each room now has a miniature refrigerator and microwave. Skelton of Hospitality Advisors Group added: "Their renovation was spectacular. They probably have the nicest rooms in town." Dahlmann declined to disclose the investment spent on the renovations, but he calls it a drastic change from the way the hotel used to look. “You could see chips in the furniture and holes in the carpet,” he said. But because the hotel had a solid exterior and a prime location near four college campuses and US-23, Dahlmann Properties chose the former Comfort Inn to add to its collection of hotels in 2006. The company also owns Ann Arbor’s Bell Tower Hotel on South Thayer Street, the Campus Inn Hotel on East Huron Street and a Campus Inn located in Madison, Wis. The sale price of the former Comfort Inn, Dahlmann added, was too good to pass up. The company acquired the hotel for $3.625 million, according to township documents. It was previously registered to Flying Dutchman Motor Inn, Inc. The hotel’s assessed value was $2.582 million in the 2010 tax year, making its estimated market value about double that. “One of the advantages of a saturated [hotel] market is we picked up this property for $30,000 a room - a favorable acquisition price - which enables us to have lower operating costs,” he explained. As part of the hotel rebranding, the pricing structure did increase slightly, Dahlmann said. Rooms have starting rates at $99 per night. The goal: provide a quality product at a lower price point than the other Dahlmann hotels. In the Washtenaw County hotel industry, the average daily rate in 2011 was $87.50, up from $82.40 in 2010, according to Skelton. In the past couple of years, Dahlmann Properties also hired 4 to 5 full-time employees and 8 to 10 part-time employees to work at the rebranded hotel. That number will increase as occupancy rates rise, Dahlmann said. He said now that the extensive renovations are completed, the hotel will undergo routine maintenance work every few years, similar to the other Dahlmann hotels. Currently, the Bell Tower’s bathrooms are being renovated. Nice, I'd like to see that kind of effort put into the building they have own down in Depot Town. Congrats to the Dahlmanns for taking a risk. Looks like it is paying off for everybody! Sat, Jan 28, 2012 : 3:53 p.m. Yes, renovations on your downtown hotels can be &quot;slow and deliberate&quot; when you have a complete monopoly! People will pay $250 a night for a tired old room with 1987 bedspreads and minuscule bathrooms when the only alternative is another hotel with the same amenities owned by the same family. Mon, Jan 30, 2012 : 4:13 a.m.
Glad to hear that the old hotel has been improved upon. I had out of town visitors stay there once before, even quite a long time ago; and it was not very good. However, even upon hearing about the improvements, I'd still be reluctant to direct out of town visitors, there. I personally thought that it should have been torn down and rebuilt from scratch. It appears there's another run down hotel across the highway from, there - the old Ramana, now named something else. That's another hotel that needs to be torn down and rebuilt, in my opinoin, also. As for Dahlmann property, not really impressed with the &quot;monopoly&quot; mentality. Sun, Jan 29, 2012 : 5:22 a.m.
Ahhhh the embassy..she's a beaut clark. Sat, Jan 28, 2012 : 9:51 p.m. Sat, Jan 28, 2012 : 3:51 p.m. This place is now so terrific- my daughter is having her bridal party stay there! Well done, Dahlmann!! Sat, Jan 28, 2012 : 2:16 p.m. They've done a nice job renovating and upgrading this former embarrassing place. Congratulations. Please don't affilate with a national brand and send a lion's share of the profits out of our area. Smart hoteliers know that it is not just the transient traffic that supports them. Success depends on local community support like holding local nonprofit fund raisers and celebrating family milestones in the new conference center are examples. Recommending locally owned properties keeps our local economy vibrant. Additionally, the new conference center concept supports local catering companies. This property does not provide food service, but offers a service kitchen for your chosen caterer to use in servicing your event - a long needed venue in our area. Let's get behind revitalizing existing properties and rethinking old paradigms to produce new business ideas. Thank you Dahlmanns. Sat, Jan 28, 2012 : 1:26 p.m.
hope it does well...it's right across the street from the excellent &quot;palm palace ' restaurant, near an AAA office .... and in the hopefully rare event of some sleazy , drug-related clientele ( not an unknown in motels next to highways) right near the county jail. Sat, Jan 28, 2012 : 12:24 p.m. Being right off US 23 at Washtenaw Ave they are placed perfectly for people coming to visit either UM or Eastern. Hope they do well. Sat, Jan 28, 2012 : 11:52 a.m. They would do better joining a national brand, often the first place travelers look when booking in an unfamiliar area.